After Arunachal Pradesh, Uttarakhand and Karnataka, yet another instance of abuse of Constitutional power by a Governor occurred this week, when Governor of Jammu and Kashmir Satya Pal Malik decided to dissolve JK assembly. J&K has been under Presidential rule since last June, after BJP withdrew from PDP-led coalition government, putting end to an alliance forged in December 2014. Earlier this week, PDP, NCP and Congress announced that they have formed an alliance and staked claim for governance. Meanwhile, reports suggested that talks between BJP and Sajjad Lone for forming government were going on in the background. 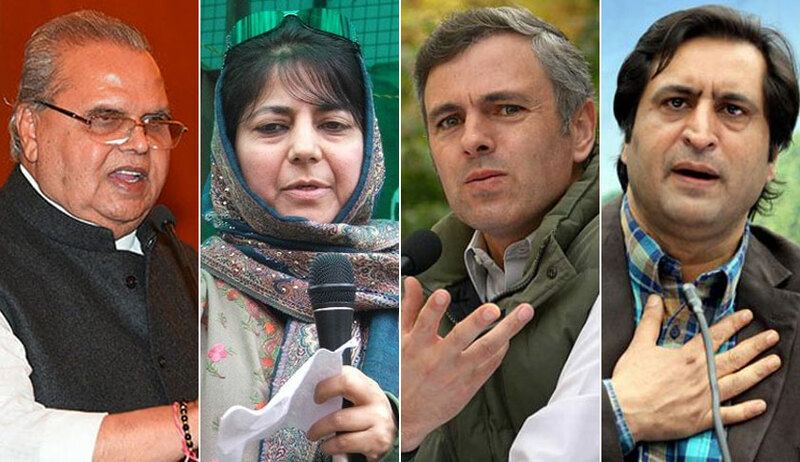 Mehboba Mufti’s PDP led coalition claimed clear numbers, with cumulative strength of 57 legislators from NC and Congress camps in the 87 member assembly. They claimed that they had intimated the decision to the Governor via fax message, which was apparently not delivered. Mehbooba Mufti took to twitter to stake the claim, by tagging Governor’s account. Not to fall behind in the race, Sajjad Lone published screen-shot of the whatsapp message sent to Governor regarding his claim. Lone’s claim was not seemingly strong, as he claimed only support of 25 BJP members and 18 “unidentified members”. While so, the Governor all of sudden announced the decision on the evening of November 21 to dissolve assembly. Media was abuzz with discussions on topics ranging from a non-functioning fax machine of Raj Bhawan and impropriety of a whatsapp claim for government to constitutional impropriety of Governor’s decision to dissolve. Governor Malik said he reached the conclusion to dissolve the assembly due to "The impossibility of forming a stable government by the coming together of political parties with opposing political ideologies" and "Reports of extensive horse trading and possible exchange of money in order to secure the support of legislators". The governor expressed doubts over the “longevity of arrangement where there are competing claims of majority. The Court held that assembly cannot be dissolved on mere reports of horse-trading and that the Governor has to explore all options of forming government to keep the mandate of people alive. By preventing a political coalition to form government on the basis of subjective assessments, Malik played out the scrip laid down by Buta Singh in Bihar 2005, which was invalidated by the SC. It is not within the province of the Governor to say that the majority staking claim will not be able to offer stable government. It is also beyond his powers to say that majority has been cobbled up through unethical means. He cannot also refuse to recognize a coalition on the ground that that constituent parties have different ideologies(It is a different matter that the government which existed till June 2018 was a coalition of “strange bedfellows”- PDP and BJP- as one used to have a soft separatist stand on Kashmir and the other espouses ultra-nationalism). These are essentially “political questions” which are to be tested by the will of people, which manifests in the legislative assembly. That is why the SC has time and again emphasised the importance of ‘floor test’ in determining these issues. The viability of the Government has to be tested in the floor of the assembly. It is within the domain of the Speaker to adjudge on issues of defection and poaching within the ambit of tenth schedule of the Constitution. In the Arunachal Pradesh assembly case, the Supreme Court chastised the Governor for interfering with the powers of the Speaker and procedure of assembly. The Constitution Bench noted that Governor was, in essence, an executive nominee. It was observed by Justice Khehar in the judgment : “Such a nominee, cannot have an overriding authority, over the representatives of the people, who constitute the House of the State Legislature and the executive Government functioning under the Council of Ministers with the Chief Minister as the head. Allowing the Governor to overrule the resolve and determination of the State Legislature or the State executive, would not harmoniously augur with the strong democratic principles enshrined in the provisions of the Constitution. The Governor cannot be seen to have such powers and functions, as would assign to him a dominating position, over the State executive and the State Legislature” (Nabam Remia and Bamang Felix vs Deputy Speaker and others). The Constitution Bench also expressly stated that it is not the business of the Governor to get involved in political equations. “It is not within the realm of the Governor to embroil himself in any political thicket”, observed Justice Khehar. By commenting on political viability of the proposed coalition, Governor Malik breached this rule. In Arunachal Pradesh case, the Constitution Bench also quoted with approval the recommendation by Punchhi Commission that power of Governor to dissolve assembly under Article 174 should be exercised only after exhausting all options of forming an alternate government. Therefore, when a coalition was formed, Governor Malik ought to have given it a chance to show its viability in the floor of the house. Instead, he jumped the gun and dissolved the assembly on the basis of his personal opinion. Post-poll alliances have validity, though lesser in degree when compared to a pre-poll alliance, and they cannot be eschewed from consideration by the Governor in the absence of other possibilities, as clear from the recent intervention of the SC in the recent case of Karnataka elections. It is trite law that Governor’s discretionary power should not be exercised on the basis of personal whims and subjective notions. What Malik may feel in his personal capacity about the claim is immaterial. As the Governor, his exercise of discretion should be guided by Constitutional objectives. Recent events reveal a recurring pattern of Governors getting reduced to mere executioners of political will of the ruling party of the Centre. In March 2016, a rebellion within Congress party which was ruling Uttarakhand then led to the Governor recommending imposition of presidential rule, without affording opportunity to the then CM Harish Rawat to establish majority in floor test. The imposition of presidential rule was held to be unconstitutional by the Uttarakhand High Court. The drama in Arunachal Pradesh in 2015-16 was driven by the attempts of BJP to exploit a rebellion in the ruling Congress party. The Governor played along, abetting the installation of rebel Congress leader Kalikho Pul as CM. The Governor’s actions were later declared as unconstitutional by the SC. After the assembly elections in Goa, Manipur and Meghalaya in 2017 which returned fractured verdicts, the Governors in respective states chose to invite post-poll alliances, ignoring the single largest party. However, this practise was not followed in Karnataka in May 2018, as the Governor chose to invite the single largest party, ignoring the claim by a post-poll alliance. In all these decisions, the beneficiary was BJP. Even in J&K, the Governor’s action is serving the interests of BJP. It is highly unfortunate to see Governors acting as mere puppets dancing to the tunes of their political masters. Well, this is not a forte of BJP alone, as it can be said that it is merely applying the practises established by Congress party, when it was in power at Centre. The imposition of Presidential Rule on the basis of reports by pliant Governors yielding to the Centre was a regular fare of eighties and nineties, which led to the landmark decision of S.R Bommai, where the Court delineated the contours of power to dismiss State Governments and dissolve assemblies. This brings to the fore the need to insulate the office of Governor from political pressures. The Sarkaria Commission recommended that a person to be appointed as a Governor should satisfy the following criteria:— (i) He should be eminent in some walk of life. (ii) He should be a person from outside the State. (iii) He should be a detached figure and not too intimately connected with the local politics of the State; and (iv) He should be a person who has not taken too great a part in politics generally and particularly in the recent past. Sadly, these recommendations are mostly observed in breach. Governor post is used mostly to rehabilitate retired politicians or offered as consolation disgruntled politicians. Unless this situation is changed by adopting the spirit of Sarkaria Commission recommendations, which were endorsed by the Supreme Court on several occasions, situations of Governors placing political expediency over Constitutional imperative by acting as agents of Centre will continue to recur.